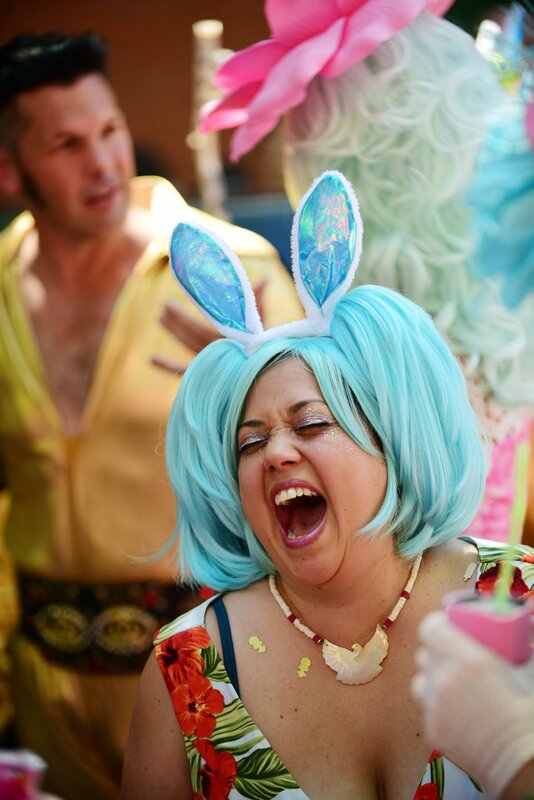 A participant laughs during the 35th Annual Chris Owens French Quarter Easter Parade in 2018. Paradegoers watch as the 19th annual Gay Easter Parade Rolls through the French Quarter in New Orleans in 2018. The 19th annual Gay Easter Parade rolls through the French Quarter in New Orleans in 2018. The parade hits the streets this Sunday. Margarita Bergen waves to onlookers during the 35th Annual Chris Owens French Quarter Easter Parade in 2018. New Orleans City Park’s newest springtime event includes a bunny ears costume contest, an egg hunt in Storyland, and amusement park rides. But if you’re interested in going, you’d better find a babysitter, because this party is for adults only. City Park’s Bunny Hops takes place on Saturday, April 20, from 7:30 p.m. to 10:30 p.m., in the Carousel Gardens Amusement Park and Storyland. Tickets are $30 per person and provide access to open beer bars, festivities and thrill rides, such as the ladybug roller coaster, the Ferris wheel, and tilt-a-whirl. It’s one of many Easter-inspired events happening this weekend, created with both children and grownups in mind. The following three days of springtime fun comprise a party on a Mississippi River paddlewheeler, lavish luncheons, and three French Quarter parades. They prove that New Orleanians of all ages and backgrounds can find a reason to slip on their Sunday’s best and celebrate. In the past, City Park has hosted “Jingle Bells and Beer”, “Boos and Brews”, and other adults-only, beer-centric gatherings. Bunny Hops will serve Paradise Park and Michelob brews, among other beverages, colorful Jello shots and fried catfish dinners. Guests can bring a bottle of wine or champagne and check in with a wine concierge, who will refill their glasses throughout the night. The merriment also involves toy eggs stuffed with tickets to attractions and park events, alcohol and of course, candy; and a prize for the most outlandish or elaborate set of bunny ears. The first 500 guests who enter the gates will receive a set of bunny ears. For more information, visit neworleanscitypark.com. The 10th annual Bunnies in the Big Easy bash, which is part of the Gay Easter Parade, takes place at the Sheraton New Orleans, 500 Canal St., on Friday, April 19, at 7 p.m. It features a limited open bar, “bunny boys” and raffles. Tickets cost $40. Proceeds benefit Food for Friends — a program of the NO/AIDS Task Force, also known as CrescentCare. Go to togetherwenola.com. The 20th annual Gay Easter Parade begins at the Rampart entrance of Louis Armstrong Park on Sunday, April 21, at 4:30 p.m. Revelers wearing costumes and bonnets will ride on buggies through the French Quarter, and stop at gay-owned businesses, before partying at GrandPre’s bar. Festivities for the 36th annual Chris Owens French Quarter Easter Parade commence at the Omni Royal Orleans, 621 St. Louis St., with an Easter hat contest, a silent auction, and live entertainment. The parade rolls at 1 p.m. and consists of marching bands and float riders tossing beads and Easter trinkets to folks in the crowd. The parade ends at the Omni Royal Orleans with a champagne brunch and live music from The Yat Pack band. Entertainer Chris Owens, the grand duchess of the Easter parade, will wear a bespoke ensemble, complete with a flamboyant hat. Easter calls to mind egg hunts and baskets filled with cellophane “grass,” Heavenly Hash, jelly beans and other candies. Members of the Historic French Quarter Easter Parade will gather at Antoine's Restaurant, 713 St. Louis St., on Sunday, April 21, for breakfast and parade preparations, which may include last-minute adjustments to their handcrafted Easter hats and baskets. The parade begins at 9:45 a.m.
“I have to make sure people know they’re plush bunnies, not real bunnies,” she continued with a laugh, noting that they do not throw beads. Participants ride in decorated carriages or convertibles, and wear wide-brimmed hats adorned with silk or fresh flowers — sometimes arranged by a professional florist — along with other clever accouterments. They complement their wearable works of art with embellished Easter baskets. The parade travels to St. Louis Cathedral for an 11 a.m. Easter Sunday Mass, and promenades around Jackson Square, before returning to Antoine's for a contest honoring women with the best outfit, hat, and basket.